This entry was posted in Uncategorized on April 25, 2014 by Buffy Silverman. 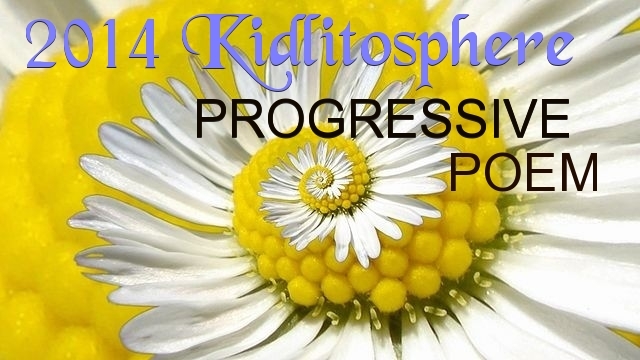 The Progressive Poem is Here Today! I’m happy to host day 20 of the Kidlitosphere PROGRESSIVE POEM, the brainchild of our poetic community organizer, Irene Latham. 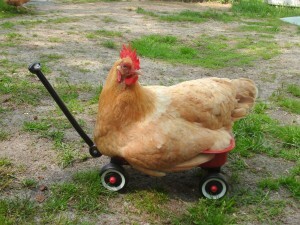 Nineteen poets have taken us on a line-by-line reflective journey that began with peacock strutting and elephant trumpeting, denied the fate of stars and stones, rode whirlwinds on eagle wings, stopped to pick up sage advice from Irene, and acquired maps and warm sapphire eggs from merry hens. As we started toward the coast, Julie invited the birds and beasts to accompany us. I’ll leave it to Renee to translate those scampering, winging words. Or to take us in another direction altogether! For a complete itinerary of our poem’s travels, please click on the links in the sidebar. This entry was posted in Uncategorized on April 20, 2014 by Buffy Silverman. I’m trying to keep up with my RhyPiBoMo pledge to write a poem a day for April. I’ve got a poetry project that I’m hoping to finish this month, but those are poems that I’m not always able to draft in a day. So I’ve also been finding inspiration in some online challenges. 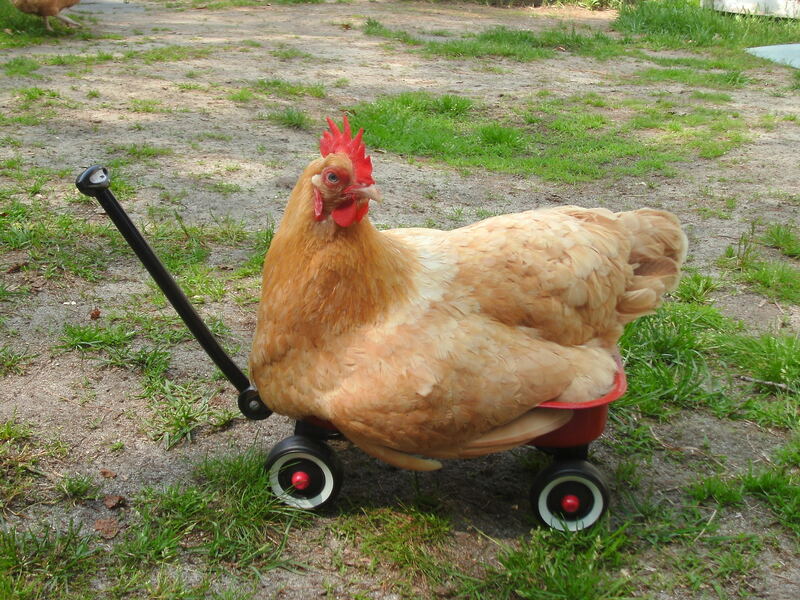 Jack’s hen was a gem that he called Sunny Placed. He took her on rides at the track where he raced. believing that Jack was a singular gent. She never suspected he’d serve Miss Placed, trussed. My original homophoem took quite a bit of revision–it’s not a poem that I would normally write. AND IT IS NOT AUTO-BIOGRAPHICAL! Okay, I’ll admit it–I did have cold feet thirty years ago, on the day of my wedding. Mostly it was because I’d gotten a baby-breath tiara, and I wasn’t sure I could wear it. 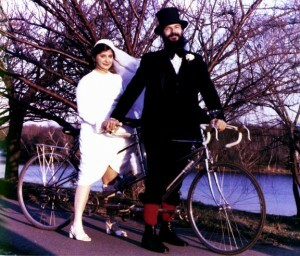 And I didn’t know why we hadn’t just gone off by ourselves to get married, as I’m not a center-of-attention type of gal. And why were we bothering to get married when we were perfectly happy living-in-sin, as we called it back in the dark ages? But I didn’t regret my choice of spouse, as in the poem below. There was a string quartet playing, but no Wagner. Both my parents walked with me down the aisle–and Jeff’s parents walked with him. Too much explanation before the poem? The string quartet plays Wagner. 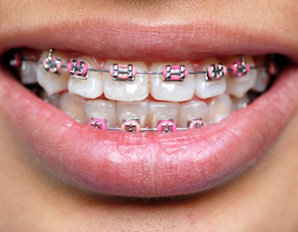 She heeds her father’s smile. past closest friends and cousins. They’re dressed in splendid style. each step that’s like a mile. She stops. She backs away. They’ll judge, but that’s her trial. than on this desert aisle. His daughter’s skill–a wonder to behold! Spin the straw, convert it into gold. A chain. A ring. Her future child sold. Find the name that no one’s ever told. 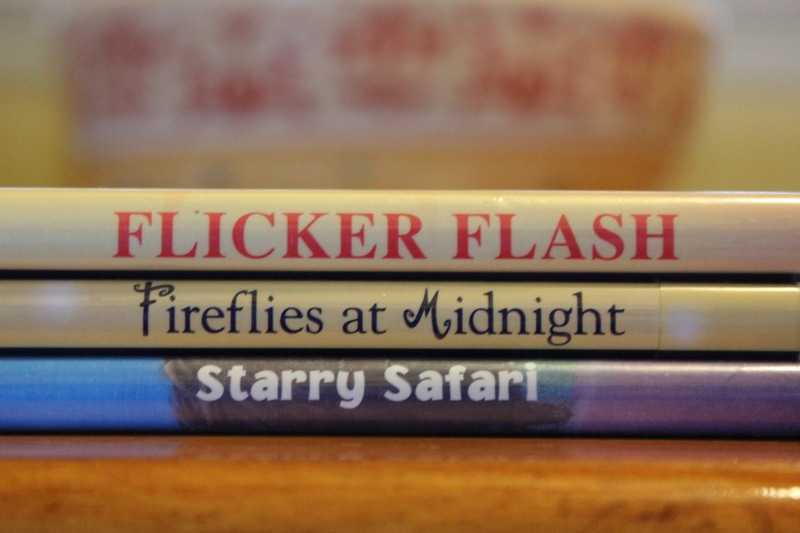 Head over to The Deckle Edge where Robyn has all this week’s Poetry Friday goodness. And please come back on Sunday when the Progressive Poem visits my blog. This entry was posted in Uncategorized on April 18, 2014 by Buffy Silverman. I wish I had had a camera with me on my walk the other day. 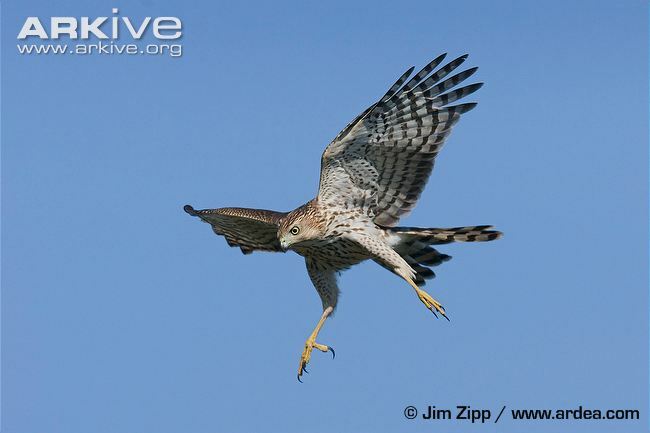 A cooper’s hawk flew low over the road (practically over my head) with a screeching squirrel squirming in its talons, the squirrel’s tail thrashing from side to side. We followed the hawk to where it landed and watched it for a minute. When we tried to get closer the hawk took off, carrying its meal to a more private place. It was amazing to watch this forest hawk zip through a suburban neighborhood. Happy spring! To find all of today’s poetry posts, visit Today’s Little Ditty where Michelle is celebrating her birthday bash and Poetry Friday. This entry was posted in Uncategorized on April 11, 2014 by Buffy Silverman. So many exciting poetry events online in April! If you have not yet perused all of this month’s poetry goodness, check out the full list at Jama’s Alphabet Soup. Catching fireflies on a summer night ranks high on my list of favorite activities. 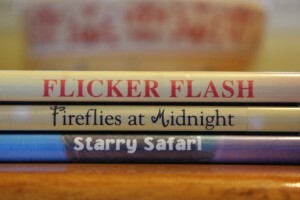 Inspiration for this poem came from: Flicker Flash, a wonderful collection of light-related shape poems by Joan Bransfield Graham; Fireflies at Midnight, an animal poetry romp from dawn ’til dark by Marilyn Singer; and Starry Safari, a charming picture book for the youngest set by Linda Ashman. Did you know that garter snakes swim in ponds and catch fish? 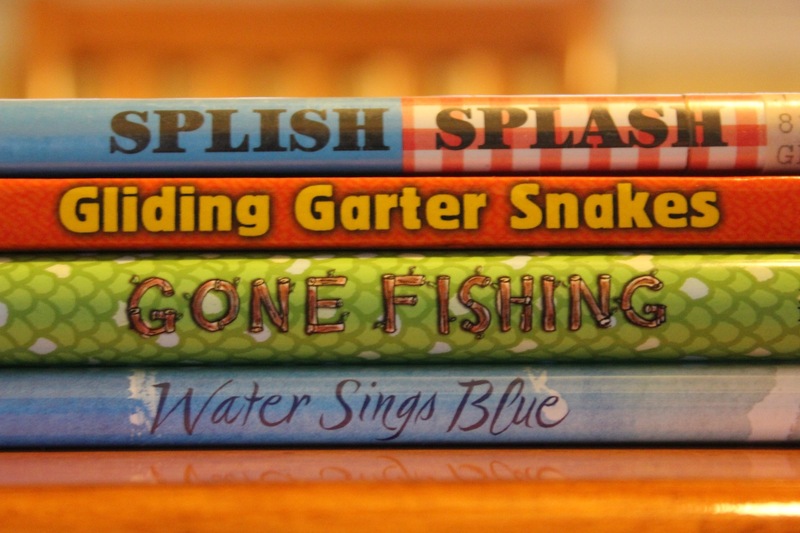 Titles for this poem came from three exquisite poetry books: Splish, Splash, another book of shape poems by Joan Bransfield Graham, Tamera Will Wissinger’s Gone Fishing, A Novel in Verse, and Kate Coombs’ Water Sings Blue. 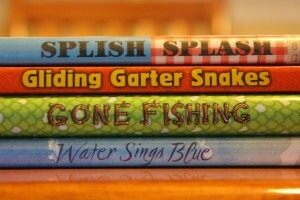 And look, my Garter Snake book is snuck in among these poetry greats! I’m aiming to write at least one poem and read a poetry collection or picture book every day in April as part of the Angie Karcher’s RhyPiBoMo pledge. Usually I fall behind on internet challenges, but maybe I’ll keep up with this one–so far, so good. Here’s my April Fool’s Day poem, inspired by Miss Rumphius’ Monday Poetry Stretch, which in turn was inspired by Laura Purdie Salas’ project of writing riddle-ku (riddle haikus) every day in April. Can you guess the answer to my riddle? wave and greet the sun. 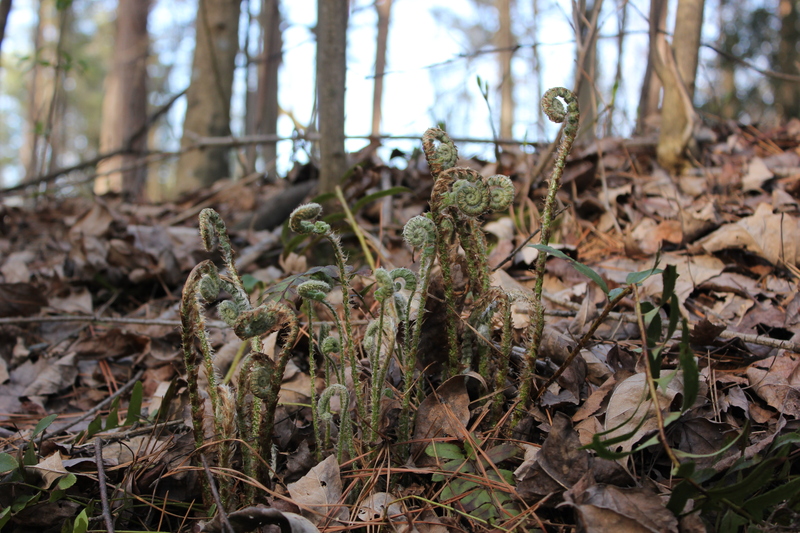 The fiddleheads are up! It must be spring. 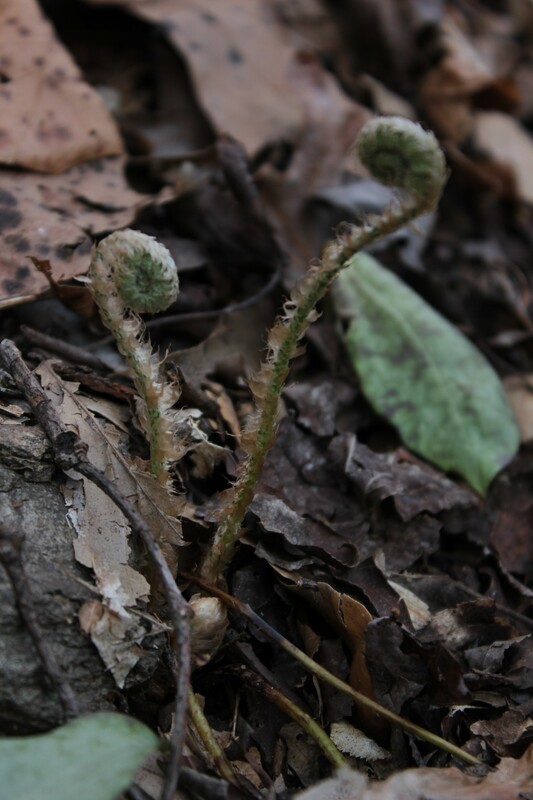 Check out today’s Poetry Friday links at The Poem Farm. This entry was posted in Uncategorized on April 4, 2014 by Buffy Silverman.